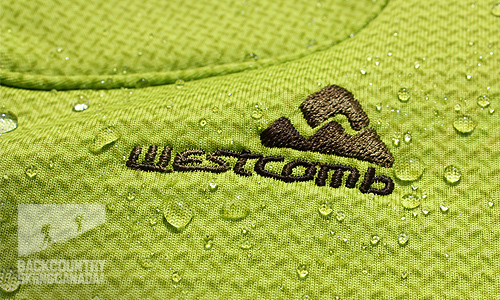 For fall 2013 Westcomb has created a new midweight fleece layer that you would be hard pressed to identify as fleece in the traditional sense (and that's a good thing). The Westcomb Boreal is the moniker of this new creation and it’s literal translation refers to ecosystems with a subarctic climate in the Northern hemisphere, approximately between latitude 45° to 65° North. Appropriate name for an insulating layer wouldn't you say? 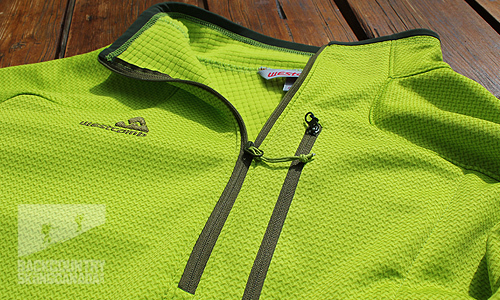 The non-fleece appearance can be attributed to Westcomb's use of a unique printed pattern on the new Polartec Hardface fabric. With Hardface, Polartec has developed a way to increase durability and water resistance properties of almost any fabric and none is more deserving than the time tested fleece fabric we have all come to loath. Traditional fleece piles easily and looks very worn out within weeks of initial wear. It has little capability to resist water and loves to collect snow flakes so they can melt all over you. The Westcomb Boreal "non-fleece" as I will refer to it from here on out is different. It doesn't pile or ball (at least in my initial tests) and it really doesn't like water. Not unlike a duck, water just seems to roll right off the Westcomb Boreal. Sure if you squeeze it in you will get wet but light moisture isn't a problem for this layer. The smooth outer surface is resistant to snags (not the dead tree kind) and slides under other layers with ease, such as the Westcomb Tango for example (link). Best of all, you reap the benefits of Hardface technology without sacrificing breathability or comfort. Westcomb also integrated Polartec's WindPro technology to increase the Boreal's wind resistance properties by a multiple of four. 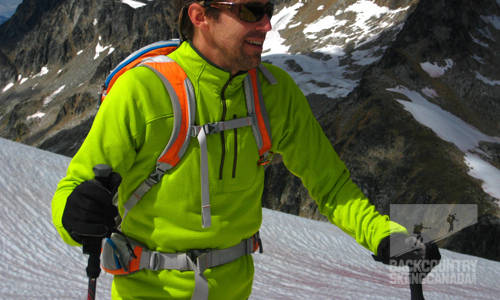 A great feature for windy ridge hikes or ski tours. Breathability is not compromised with WindPro so while it will cut the wind it will also let excess heat escape and thus keep you not too hot. 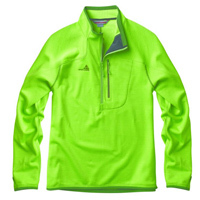 If you need to dump even more heat, the 1/4 zip allows you to easily let some warmth out and a cool breeze in. On the inside the Boreal fabric there is a soft waffle-faced pattern that is supposed to provide micro air channels to increase breathability while keeping you warmer and drier. This is a hard claim for this reviewer to quantify but what I can tell you is that this waffle texture feels far superior on bare skin when compared to traditional fleece. This bumpy surface stimulates your skin and provides really interesting feel that you would have to experience in order to understand. Westcomb was able to make the Boreal their lightest technical fleece layer to date but that doesn't mean they skimped on features. A nice stand up mandarin collar with contrasting piping (also found on the sleeves and at the hem) add to the look and functionality. The integrated thumb loops also contribute to the technical look and while I am not a fan of these traditionally I did find that Westcomb integrated them in an unobtrusive manner. The feature list is rounded out with a napoleon pocket complete with media port pass through which enables you to actually use this pocket for something other than just looks. Sheds light rain and moisture quite well. - Raglan sleeves which uses one piece of fabric from wrist to collar and provides a single diagonal seam and improved aesthetics. Nice details and fabric choices. 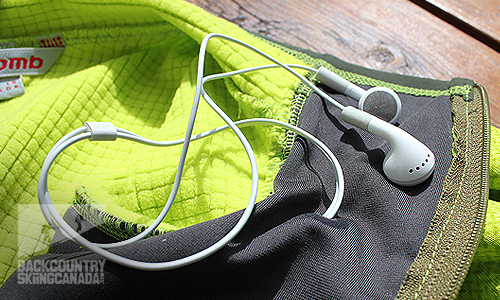 Chest pocket is large enough to be useful for all sorts of things. 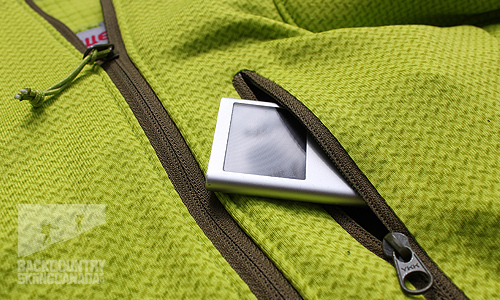 Media port pass through allows you to store your ipod or MP3 player in the chest pocket. 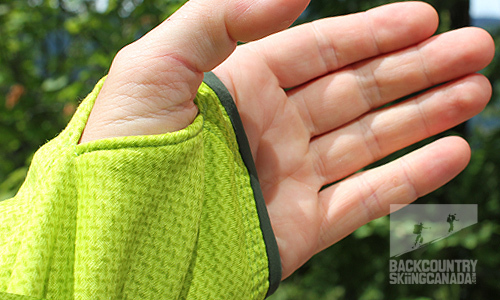 Thumb loops if you are that kind of guy, or not. Like most Westcomb garments the Boreal is exceptionally well designed and manufactured. The materials used and attention to detail are unsurpassed on the Boreal. I have owned my fair share of 1/4 zip fleece layers over the year and the Westcomb Boreal is head and shoulders above all the others. It's a shame to even call this piece a "fleece" layer as it looks nothing like fleece and is far more stylish. On the performance side of things the Polartec Wind Pro does its job and cuts the majority of wind while the Polartec Hardface technology prevents it from balling like traditional fleece. The added features such as thumb loops, napoleon pocket and media port are welcome and only serve to round out an already great layer. The fit and weight are also bang on for my body type. On a recent climb up Grey's Peak in Kokanee Glacier Park here in the Kootenays the morning temps were in the single digits and it kept me warm on the first thousand feet of the climb. As we topped out above 9,000' the winds picked up and again the Boreal came out of my pack cut the mid afternoon alpine winds. The only downside to the Westcomb Boreal that I can find is that I feel guilty taking such a beautiful fleece layer into the mountains, but I guess that's what its built for. For additional reviews of Westcomb products have a look at our reviews of the mens Westcomb Revenant Jacket,Westcomb Focus Hoody, Westcomb Shift LT Hoody, Westcomb Boreal Fleece, Westcomb Tango Hoody, Westcomb Cayoosh LT Down Sweater, Westcomb Apoc Jacket and the Westcomb Orb Sweater. On the womens side check out the Westcomb Drift Hoody.